Recently, we had yet another scare about an allegedly malfunctioning satellite. Russia’s Foton M4 recoverable spacecraft didn’t want to listen to mission control for a few days, prompting fears that the mission was lost. Since then, contact and control has been restored to the spacecraft. It has been suggested that the spacecraft will not be raised from its sub-nominal orbit to avoid disrupting the microgravity experiments on board. Foton M4 will probably carry out a slightly truncated mission before making a controlled reentry. We dodged a bullet this time. But the Foton M4 scare was a reminder of a problem that is steadily growing within spaceflight. What goes into low Earth orbit must come down. Mostly this happens without problems for those of us on the ground, but there have been too many contingencies. The international spaceflight community really isn’t addressing the problem as much as it should. That could have consequences far beyond the scare of any single incident. As opposed to a satellite, which burns up on reentry, a Foton capsule is designed to survive reentry and land safely using its own parachute. This would make particularly problematic the scenario of an uncontrolled reentry. – Credits: ESA. Let’s start with the good news. The Earth is big. Most of it is covered with water. Much of the land is sparsely inhabited or uninhabited. Most satellites burn up on reentry, too. The chances of anyone being killed or injured by a falling satellite are not very high. But that’s not enough to keep everyone happy, nor should it. At some point, we must have more than sheer dumb luck as a countermeasure. The element of luck is tied into the key problem. We’re playing Russian Roulette every time a big bird, Russian or otherwise, falls back. We cannot say when or where it will reenter. We cannot say exactly what will survive reentry. We can’t say where any fragments will fall. We can’t say if they will be big enough to pose a risk to safety. 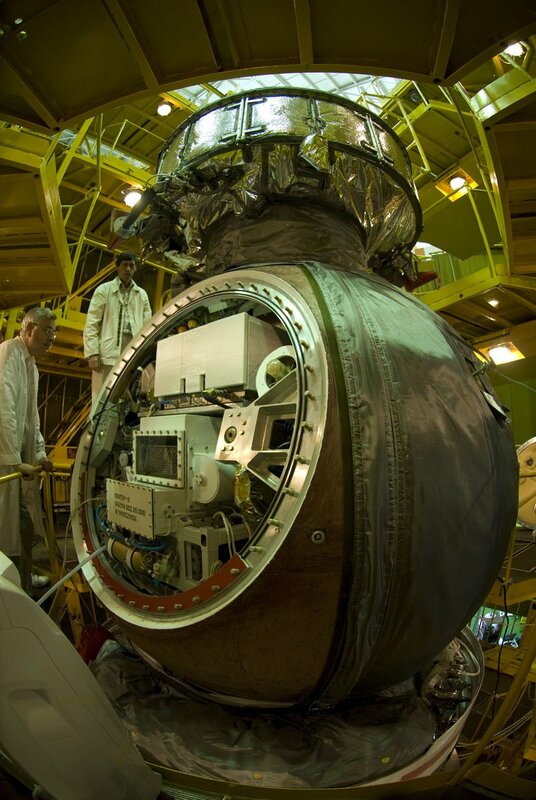 Preparation of the Foton-M3 spacecraft at Baikonur Cosmodrome. 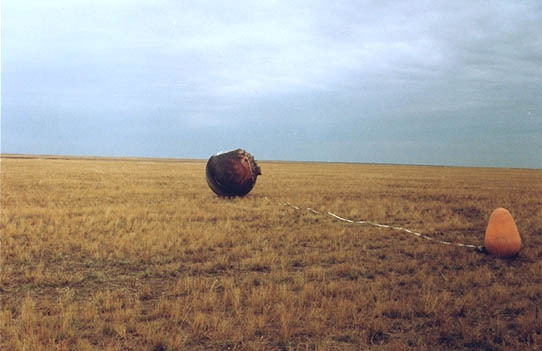 The capsule spent 12 days orbiting the Earth, exposing its experiments to microgravity before reentering the atmosphere and landing in the border zone between Russia and Kazakhstan (Credits: ESA/S. Corvaja). Again, we must be fair to our scientists and engineers. Estimating such factors is devilish. There’s the fickle nature of space weather. There’s the atmosphere to consider, which is affected by influences from the Sun. There’s the nature of aerodynamics on objects that are not exactly aerodynamic. There are unpredictable patterns of breakups and failures during the reentry process. Fair or not, we still have a problem. The public and the media know it, and they won’t be as forgiving as the space sector itself. Falling satellites are appearing regularly in the mass media, bringing attention to this problem to the wider world. Recently, a Russian rocket stage peppered debris over Australia. We have also seen the very high amount of media attention paid to the reentry of NASA’s Upper Atmosphere Research Satellite in 2011. Soon afterwards, Germany’s ROSAT astronomy satellite made another high-profile atmospheric dive. Then there’s the controversy surrounding the decision to destroy the classified USA193 satellite with a missile in 2008. So what can we do? Some people may want to see dangerous satellites blown up. The USA has the capability to do this, as the aforementioned USA193 incident proved. Other nations have experimented with anti-satellite weapons, but it isn’t really clear if these systems are considered operational or reliable. The topic is highly sensitive and controversial, more so than the controversy surrounding falling satellites themselves. There have been calls for space tugboats and other debris removal technologies to de-orbit satellites safely. Nice in theory, but we have yet to see this happen in practice. Somebody has to pay for it. Somebody has to agree to it, including the owner of the “junk” satellite. Somebody has to accept the risks and the blame. Some of the efforts to deploy such vehicles may succeed in the future, but will they be enough to solve the problem? It’s difficult to deal with this, but at some point the spaceflight community has to lift its game. That means better technical solutions as well as predictive models. The public may sometimes be unfair in their judgment of specialized technical topics, but it’s not wrong for them to expect a reduction in these problems. We focus heavily on making spaceflight safe for astronauts and we are increasingly focused on ensuring the safety of uncrewed spacecraft. It’s about time we gave more thought to the people on the ground. If uncontrolled reentries of large spacecraft become too common, an angry public could be more of a threat to global spacecraft than satellites are to them. They can influence government policies and actions. With so many problems facing spaceflight at the present, we cannot afford to make any more enemies. Feature image: Rendition of a Foton M family Space capsule. Foton M4 is the latest in the series of automated scientific vessels (Credits: Roscosmos).